Good-day blogger friends! I do not have anything of great importance to share with you, just stopping in to say hello! I am ready for Christmas...other than a few last minute gift items and the grocery store. Shopping early & Amazon.com made the season bright and stress free this year! 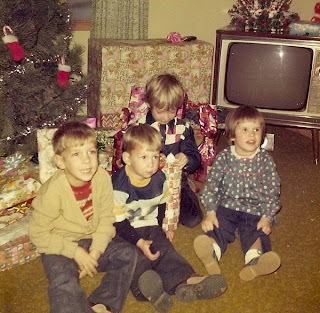 Mike, Layne, Ed & Little Bsktgirl - age 3. In looking through my book of old photos looking for Christmas pictures, I discovered that many of them are not approriate for publication. :) The tradition at our house was to open gifts bright & early Christmas morning, therefore the precious few photos that I have are blurry eyed + bed head + pajama shots. I also realized that I have no photos from Christmas on Dads side of the family...probably because there was such a hoard of us no one even thought of getting the camera! I may regret this...but do any of my cousins have Christmas photos? Back in the day of film cameras, a person only took a few pictures - between buying the film + bulbs + processing - you didnt want to waste money on a bunch of pictures with eyes closed and a thumb in the photo! I believe most of my childhood photos were taken with the Kodak INSTAMATIC. Pretty old school, huh? Now in the digital age, kiddos will have many more childhood photos and have the gratification of viewing the picture instantly. Lucky ducks! In other, unrelated news, check out this coolness...here, here, and here! Have yourself a good day! Nice post! I don't think I have many Christmas photos, either. Interesting how photography has changed with a delete button, isn't it? LOVE your Christmas card!!! 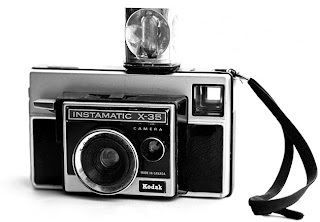 I remember the Instamatic. It would be neat to have now, wouldn't it? I even remember when it went kaput on vacation in Florida. Wow, that photo at Grandma's house really looks vintage, doesn't it? :) Ha! Love you.